When you go to query it, just keep in mind that Parameters is an ntext column, so you’ll want to use ‘like’ instead of trying to ‘=’ with a particular string. Not sure what they didn’t make it nvarchar(max) since that was introduced in 2005, although it may be just to minimize the change between the 2 views. 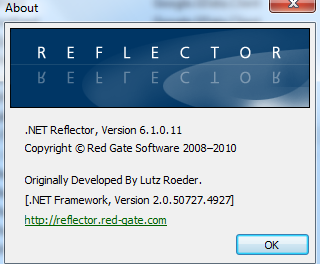 Edit [2010-03-01] – turns out Reflector can’t handle reversing any iterator blocks. Ouch. I’m not sure how helpful this post will be for others, but I needed a place to stick screen shots since I can’t attach files to Reflector’s in-app “Send Feedback” dialog nor when creating posts in their forum. Feed<T> in that assembly has a nice Entries property of type IEnumerable<T> (starts @ line 202 in current trunk version of the file) implemented as an iterator block (using “yield return”, “yield break”). 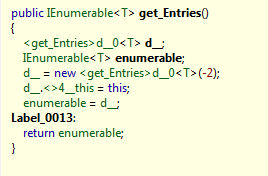 It certainly has more logic than the average iterator block you’ll find out there, so I’m guessing part of the work the compiler had to do when implementing it confused reflector. Whatever the cause, Reflector doesn’t currently handle correctly reversing it back to the iterator block in the source. Reflector still shows you the generated code, of course – it just failed in whatever pass it does to identify these bits as the generated pattern and reverse it back. EDIT: as it turns out, this was just caused by a bug that snuck into the server side – the normal GData.Client.dll that sends the BOM works fine now, as does the modified one that doesn’t. Just a couple of days before it was announced on their blog, I had started searching for available API’s (ideally already in .NET) and ran across their YouTube SDK and the larger GData SDK on their project download page. Awesome! Their wiki also described a sample app that would be perfect for me to learn from – YouTubeUploader! One thing I noticed, though, was looking around the filesystem I didn’t see the source for YouTubeUploader. I could certainly run reflector on it (and did), and that’s certainly a lot better than nothing, but it was odd that all the other samples had source but not this one (the later announcement would explicitly say you had to get the source via subversion). At that point in time, I actually had 5 videos left that hadn’t successfully uploaded with FlipShare, so I tried to use the YouTubeUploader app to get them uploaded. Its interface to the user is a CSV file you need to create to define title/tags/category/path/etc. No biggie – I open Excel and make it, then save as csv (I’m too lazy to make the CSV by hand, worrying about quoting strings with commas and the like). However, when I actually run it, the uploads all fail (doh!) with “400 Bad Request” (that’s what shows up in the UI). I figured I’ve just got something misconfigured, so I try a bunch of different things in the UI, in a YouTubeUploader.exe.config, etc., but no such luck. At this point I think about just ditching it here rather than go down the investigatory rabbit hole, but since it’s from the GData team and it’s the sample I’d really like to start with, I press on. So, time to dig in to figure out what’s going on. I run my current go-to tool for HTTP debugging, Fiddler, and then restart the app and have it try again. As I should have expected, it does the calls over https and Fiddler in the middle is breaking all the calls since it’s not a trusted CA. I hadn’t actually added Fiddler as a trusted root CA before, but there’s nice simple instructions to do so. With that working, I look at the request and response of a failed call. You can see them in the bug I filed, but the problem didn’t jump out at me at first. I googled the error message (“Content is not allowed in prolog”) and much like you’d expect, it comes from having stuff show up before the xml prolog (“<?xml … ?>”), breaking the xml parsing (from the hits, it appears to be in Java XML parsing, not that it matters). So I look back at the request again and I didn’t see anything before the prolog. However, Fiddler has a ton of different ways of showing the request and response, including a handy-dandy hex view. That show that there are indeed 3 bytes between our HTTP-spec 2 newlines (separating headers from body) and the xml prolog itself. The bytes are 0xEF, 0xBB, and 0xBF. Those bytes seem oddly familiar, and Google reminds me why – it’s the UTF-8 Byte Order Mark. Ah, yes, it all starts to make sense. So, more googling and I run across the post that confirms what’s going on with XmlTextWriter along with a fix (Thanks Rick!). Looking at YouTubeUploader’s source, it’s just using the ResumableUploader class in Google.GData.Client.dll, so it seems clear the bug isn’t YouTubeUploader’s fault. Since it presumably was working for others, I was wondering if maybe it was something in the BCL (having 4.0 RC on the same box, although it should side-by-side fine and I had checked that YouTubeUploader was still running under 2.0/3.5. Stepping through in the debugger, I see the offender – AtomBase.SaveToXml(Stream) does exactly what Rick’s post said – creating the XmlTextWriter with Encoding.UTF8, which writes the BOM. At the time I was having problems rebuilding things (long story with no value – PEBKAC 🙂 so I wanted to verify that’s the problem by modifying the requests. I knew Fiddler had this capability but I had never done it before. Looking through the cookbook samples, though, it seemed pretty straightforward. I ran YouTubeUploader again with that rule in place, and sure enough, the uploads start working fine! Yay! Goal – get the info directly from flipshare.db. If you’re trying to interact with the actual videos on disk, you’ll notice there’s no description in them at all – look under Videos\FlipShare Data\Videos and you see VIDnnnnn.mp4 files (where nnnnn appears to be a normal monotonically increasing integer, at least at first glance unrelated to any of the PK id’s in the database). Since we want to upload our videos with the (arguably, meta)data that’s shown in the FlipShare UI (logical folders, titles, etc), we need to access that flipshare.db sitting in your Videos\FlipShare Data folder. We could use FlipShare’s export feature, but that would mean taking more disk space than required and we’d have to re-export if we wanted to ‘sync out’ changes to titles, and AFAICT it wouldn’t reflect the logical folders (at least not automatically), just the titles. The closest I found to an existing schema explanation was this post which admittedly does give you the 3 tables that hold the pieces of data you need – the title, the video location on disk, and (kinda optional if you just want to upload the video by title) the logical folder it’s in. The problem for me was figuring out how to join these together. SQLite supports foreign keys (well, at least 3.x does, not sure if that’s new though), but flipshare.db doesn’t use them, so I started to look at the data in my db’s tables to see if I could just notice it from the data. The 2 tables I cared the most about were MediaElement and MediaElementSource since they hold the title and video file path, respectively. I looked at the data of each to try and find the join condition, but nothing matched up. Now I had the PK values for the 2 tables I cared about for a single video. Now I looked for data in the database (using .output and .dump in sqlite3.exe) that referenced those 2 values (in either order, of course), hoping there would be a single mapping table involved. No such luck. At that point, knowing it must be a join of more than 3 tables, I gave up on trying to inspect my way to the join conditions. Since Core.dll seemed the more likely place for the DAL I then ran strings.exe on the file, dumped it out to a text file, then started searching for the table names in the output. I found a query that joined MediaElementSourceGraph (which I had already noticed during the manual schema inspection was linked to MediaElementSource by its mediaSourceId – nice, friendly FK name, even if not defined strictly as a foreign key) and MediaElementRendition (which I had similarly noticed was linked to MediaElement via mediaElementId, also clearly an FK name). As a bonus, we could add in the logical folder location for the video, which was much easier to figure out since UserFolderMediaElements is a simple mapping of videos (MediaElement rows) to logical folders (UserFolders rows) as you could tell by its name, so it was just adding those 2 more tables (6 total) to get all the info we’re looking for. Using LinqPad 2.x with the IQ driver (so we can query SQLite) we can use linq’s support for joining (even without foreign keys in place). It defaults to a couple of common conventions I’ve seen in other OR mappers (linq-to-X and otherwise), making the table names plural (but not the row entity singular if the table is already plural, oddly enough IMHO) and init-cap’ing the property names. You could certainly turn those off, the query would just need to be slightly different. One optional where clause (commented out below) is checking the folder’s ParentId – for the FlipShare logical folders (under their ‘Computer’ node), the parent id is 8 (at least in my database 🙂 – i don’t see this in another table, so I’m guessing it’s a defined constant in the code (looks like folder id’s under 1000 are likely that way). I don’t need this at the moment since I don’t have any videos in other areas (like the ‘Flip Channels’ node), but if you do, you might want that filter. I got asked what my impressions are of the Flip UltraHD I’m testing out. The hardware itself is fine, although a little mediocre in 2010 since the bar’s constantly going up (720p instead of 1080p, no image stabilization, but pretty good in low-light, and the “candy bar” form factor is more usable than I expected), but FlipShare, the software that comes with it, is the linchpin for the overall user experience that is really the main goal on selling it (something akin to Apple product experiences, IMHO). The box came with version 4.5 of FlipShare which had a good chunk of things I found annoying, but after the upgrade to their 5.0 version (5.0.5.52727 at the moment), the majority of those went away – it’s a nice, solid, very usable interface. Good WAF, too. For a LONG time, FlipShare isn’t actually uploading anything and is just hogging CPU. Is it transcoding or something? It doesn’t (or at least, shouldn’t) need to (already H.264 MP4 coming off device). I can upload the files directly with no transcoding using other youtube uploaders. Related, apparently no resumable uploads? When a job fails, especially if you had multiple upload jobs going in parallel, you can’t tell which videos didn’t make it without inspecting what’s on youtube. Bonus: allow "syncing" of videos up to YouTube such that it checks whether a file is already up there (name, length, hash, whatever) and skips it if so. Remember that previous post about List<string>.Add? Well, one of the uses of the messages was to get into an email. Unfortunately, there’s not an Attachment ctor that takes the contents of a file – it’s all around passing in a filename or a stream. Since I don’t want to have to write this out to disk, stream’s the way to go. // Attach the message string to this e-mail message. // Send textMessage as part of the e-mail body. Since someone will likely point it out – I know the memory behavior of this isn’t great – we end up with the same content in 3 places: 1) the List<string> 2) the file content 3) the memory stream’s byte buffer. You could certainly have created the MemoryStream, wrapped it in a StreamWriter, then written the messages to it instead of the List<string>, reset the position before passing to the ctor, and been down to 1 copy of the contents in memory instead of 3. Mitigating factors are: 1) This code path isn’t used in production and 2) we’re not keeping the copies around very long – the first 2 copies are free to be GC’d after the Add of the attachment since they’re local vars that go out of scope. Of course, maybe it’s just caffeine that’s got him wired. If you think that by threatening me you can get me to do what you want… Well, that’s where you’re right. But – and I am only saying that because I care – there’s a lot of decaffeinated brands on the market that are just as tasty as the real thing. as many of you remember, Hashtable did (well, still does) store objects (just like ArrayList and the other non-generic collections). When a key wasn’t found, it would return null back as a way of saying “not found”. This was kind of painful as an approach, since many times applications ended up with null refs after doing a failed lookup that didn’t throw. Dictionary fixed that such that lookup that fails to find the key will throw since, being generic, the value type (as in, the TValue type in the generic type params) might be, well, a value type (as in, not a reference type, so it can’t be null), so you can’t use null for differentiating failed-lookup from look-succeeded-and-found-value-of-null). If you want to try and get the value but not have an exception to deal with if it’s not there, Dictionary gives you TryGetValue which will try to fetch the value (into an out variable you have to declare first) and then return a bool for whether or not the lookup succeeded. It gives you everything you need. If you hate that change in behavior, don’t worry, it was hashed out (internally and externally) to death – here’s a related blog post about the change from during the Whidbey cycle – the comments should give you an idea of the sides involved. The 2 generic type params might seem scary, but since they’re the same ones in the dictionary that’s passed in, the compiler can infer them, so you won’t have to specify them yourself. What really strikes me as odd is that this means when you add extension methods to a type (even part of a public API), you’re taking a gamble that the type won’t add the same method+params itself – if/when it does, your next build will start calling a totally different method with likely different behavior, return values, side effects, etc. All without ever doing anything in your code to say you wanted to call this new method. And without ever getting warned about this potential ‘conflict’/’redirect’ situation. A real-world example of hitting this is the upcoming .NET 4.0 methods – I had added a CopyTo extension method awhile back to Stream (so I could take streams from SSRS and send them to the Response.Output stream in some asp.net pages). Admittedly in this particular case the behavior is likely the same, but what if my version had doing a .Position = 0 on the source after the copy to the destination and I relied on that? IOW, without the compiler at least warning about this situation, you have what amounts to a breaking change (from my app’s perspective) brought in by a new framework that made a nice, innocuous, should-not-break-anything change. Perhaps I’m overreacting but it seems like the spirit of the C# compiler (at least, my very vague understanding of it 🙂 is being violated with the current behavior.